CFMS Consulting Inc. | 2012 | September | CFMS Consulting Inc. Welcome to CFMS’s first blog post! 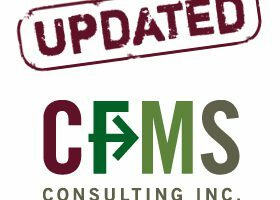 This is an exciting time for CFMS, as we mark our 20th Anniversary of CFMS, and the launch of our newly expanded website. We are endeavouring to have a more interactive online presence, which includes providing a weekly blog column to provide visitors, clients and partners an opportunity to get to know us, and our business, a little better.